This is the newest offering from SSS (although I’m sure nose Laurie Erickson is at work on another scent, because that’s how she rolls), meant as a virtual-reality meander through a beautiful West Coast forest. Laurie kindly sent me a sample of a late-May mod, and then, a few days later, a sample of the finished product. I’ve delayed writing this review mostly because of the small changes in the second sample. What I’m reviewing here is the final version, and it is really, really nice. Forest Walk opens with some bracing, turpentiney pine/fir notes, which I love. They make me want to open my mouth and throw back my head and take deep deep breaths of fresh outside air. Those deep green notes segue nicely into a jasmine/sandalwood-dominant scent. I don’t catch the violet at all (but then, violet tends to play peek-a-boo with your nose anyway). The cedar and sweet amber notes begin to be more noticeable as time goes on, as well as a bit of moss. 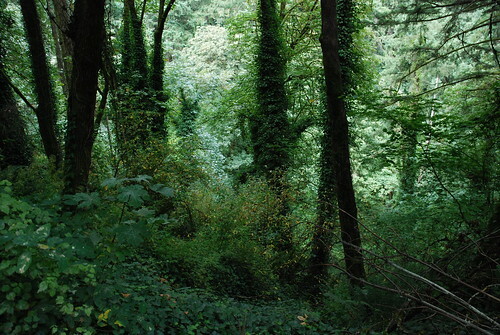 Forest Walk is very obviously a Sonoma Scent Studio fragrance – I think it’s the sandalwood-labdanum combination – and reminds me quite a bit of Champagne de Bois, once the bracing green opening has passed. It does live up to its billing as “a soothing walk in the woods.” True, these aren’t my woods, pungent with deciduous leaf mold and dry pine needles. But the fragrance does imply the hemlock and evergreens of a Pacific Northwest forest, with a sweetness underneath. It’s quite lovely, and “soothing” seems an appropriate word for it. The notes, according to the SSS website: fir, hemlock, oak, jasmine, violet, cedar, moss, sandalwood, amber and benzoin. I will say that the 5/12 mod seemed much greener to me, and I liked it better because it seemed more distinctive, less like Champagne de Bois (which I do like, very much). The final version has a tiny bit more jasmine in it, and in an email conversation, Laurie commented that adding that little bit of jasmine seemed to boost the perception of the sandalwood, tipping the balance just a bit away from the moss notes. I find that very, very interesting – that the sandalwood wasn’t increased, but adding the jasmine made the sandalwood seem more prominent. Fascinating, isn’t it? *Laurie mentioned in a June email to me that she might still have tiny amounts of the 5/12 mod, if you’re dying to try it. You’d have to email her to see if it’s still available. I love the opening of this scent! For a couple of years I lived in the mountains in Western NC and hiked with my dogs as often as possible. The initial spritz of this reminds me of the moss and lichen that grew on stones in the rivers and streams that we hiked along and across- Cool, Green, Fresh, and Humid. The dry down on me is a lovely soft floral (the jasmine and violet, I guess) mixed with woods. I wore this yesterday, one spritz, and when I went to bed last night it was still singing- excellent longevity and an all around lovely scent that I associate with some great memories. The opening is so lovely and green! I think it is beautiful; I was just a little disappointed that the final version went sweeter than the first sample I tested, which seemed more unusual to me. For me Forest Walk is too intense as a perfume. But recently I tried dilluting it and I think it makes a perfect cologne. Huh. I know SSS fragrances are essentially parfum strength, so I can imagine that dilution would open them up a bit. Bizarrely, Forest Walk died on my skin in less than an hour. My skin or my scent brain at fault? Not sure. What I did smell I liked but the scent is so close to the idea of a walk in a forst that it felt not quite like a perfume I would actually wear. But your review prompts me to try it again. Less than an hour?? Huh. Interesting. There are things that do that on me, but rarely an SSS. Lovely review mals! I’ve got my sample of Forest Walk too and I’ve been planning to work with it for my blog this or next week. Oh, looking forward to your review! Thanks for the in depth review. I’m curious to try this one, and now even more so based on what you’ve written here (although I suspect I might have liked it more mossy). Oh, yes – definitely try it! I did like the pine-ier one better, but it’s good.